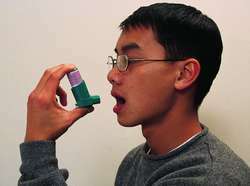 1. an apparatus for administering vapor or volatilized medications by inhalation. metered dose inhaler an inhaler used to deliver aerosolized medications in fixed doses to patients with respiratory disease. Metered dose inhaler with a barrel device. 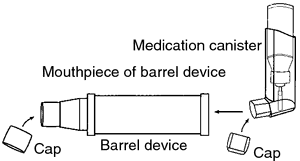 From Lammon et al., 1995.
a device designed to deliver a measured dose of an inhaled drug. It usually consists of a canister of aerosol spray, mist, or fine powder that releases a specific dose each time it is pushed against a dispensing valve. The device is intended to reduce the risk of overmedication by the patient. Pretreatment values of forced expiratory volume in 1 second varied between 61-74%, 60-77%, 62-75% and 58-77% before giving budesonide by nebulizer (week-2), metered dose inhaler (week-3), metered dose inhaler with spacer (week-4) and dry powder inhaler (week-5) respectively. Inappropriate techniques used by internal medicine residents with three kinds of inhalers (a metered dose inhaler, Diskus, and Turbuhaler): changes after a single teaching session. One hundred patients were enrolled, based on the following inclusion and exclusion criteria; Male patients between the age of 15-60 year, having asthma or COPD using pressurized metered dose inhalers on regular basis were included in the study. The types of inhalers that are available for patients are metered dose inhalers - this is the spray that is known as the MDI, dry powder inhalers and nebulisers. Market size and company share data for Drug Delivery Devices market categories - Infusion Systems, Metered Dose Inhaler Devices, Central Venous Catheters and Needle Free Injections. At this point they can use a dry powder inhaler or a metered dose inhaler with the choice depending on the child's preference and their inherent ability to use the chosen inhaler. com/research/49a1d8/drug_delivery_devi) has announced the addition of the "Drug Delivery Device Market to 2017 - Metered Dose Inhalers and Infusion Pumps to be Key Revenue Generators" report to their offering. Market size and company share data for Drug Delivery Devices market categories - Central Venous Catheters, Infusion Systems, Metered Dose Inhaler Devices and Needle Free Injections. com/research/17d2fa/drug_delivery_devi) has announced the addition of GlobalData 's new report "Drug Delivery Devices Market Outlook in Czech Republic to 2017- Metered Dose Inhaler Devices, Infusion Systems, Central Venous Catheters and Needle Free Injections" to their offering. com/research/d990f9/drug_delivery_devi) has announced the addition of GlobalData 's new report "Drug Delivery Devices Market Outlook in Taiwan to 2017 - Metered Dose Inhaler Devices, Infusion Systems, Central Venous Catheters and Needle Free Injections" to their offering. com/research/f48a88/drug_delivery_devi) has announced the addition of GlobalData's new report "Drug Delivery Devices Market Outlook in Netherlands to 2017- Metered Dose Inhaler Devices, Infusion Systems, Central Venous Catheters and Needle Free Injections" to their offering. com/research/7fbe9c/drug_delivery_devi) has announced the addition of GlobalData 's new report "Drug Delivery Devices Market Outlook in Italy to 2017- Metered Dose Inhaler Devices, Infusion Systems, Central Venous Catheters and Needle Free Injections" to their offering.